A man has been arrested following an attack on an anti-foxhunting group as they monitored a Boxing Day meet. A member of the Hunt Saboteurs Association has alleged to police he had a brick thrown at the window of his car, had his iPad and keys stolen and was assaulted with sticks as he monitored the Southdown and Eridge Fox Hunt in Plumpton on Boxing Day. Sussex Police said a 23-year-old local man was arrested for criminal damage, assault and theft and bailed until January 30 while the investigation continued. A spokesman from the Hunt Saboteurs Association said: “About seven masked men came running towards our parked 4×4. “One of our members locked himself inside the car for protection. 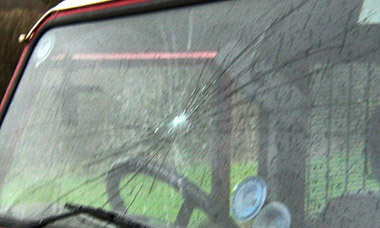 “The windscreen was smashed, another man was trying to smash the driver’s door and a third came through the rear door. A spokesman from Sussex Police said: “Police are investigating a report of an attack on a man monitoring the Southdown and Eridge Hunt on Boxing Day. “The man says he was in his Landrover at Plumpton on Wednesday morning when he was attacked by a number of men who had approached on quad bikes. “He said he was hit with sticks, suffering a cut to his hand and had his iPad and ignition keys taken. In October, members of the Hunt Saboteurs Association said they were attacked by masked men while they monitored a meeting in Firle, near Lewes. On that occasion, a 28-year-old man was arrested on suspicion of assault. He was bailed until December 3 but police have since decided that no further action will be taken against him. The Southdown and Eridge Hunt Secretary, Mrs D Grantham, refused to comment. Anyone who has information about the Boxing Day incident is urged to contact police on 101 quoting serial 0395 26/12 or the independent charity Crimestoppers on 0800 555 111.